In a couple days the results of the 2010 Hall of Fame ballot will be announced. It’s a compelling ballot, filled with a host of interesting newcomers and long-suffering ballot near-misses such as Bert Blyleven and the player shown here in a card I must have left in my pants pocket for a trip through the washer and drier. Where are those pants now? I was thirteen and had graduated from Toughskins to Levis by then, I think. I remember how much I revered Levis as a talisman of cool. My brother and I even had Levis posters on our wall, crowding the older posters of Hank Aaron, Jim Rice, and David Thompson. The posters featured worlds made entirely out of Levis. The one on my side of the room was of a Mississippi River scene. The river, the dock, the steamboat paddles: everything was made out of Levis. The coming of Levis into my life coincided with the exit of baseball cards from my life, with a bit of a cross-over between the two eras in 1981, when I purchased a few packs. Some things were cool and some things weren’t, and Toughskins and baseball cards were receding to the latter category. This 1981 Andre Dawson card probably resisted my efforts to push it away. 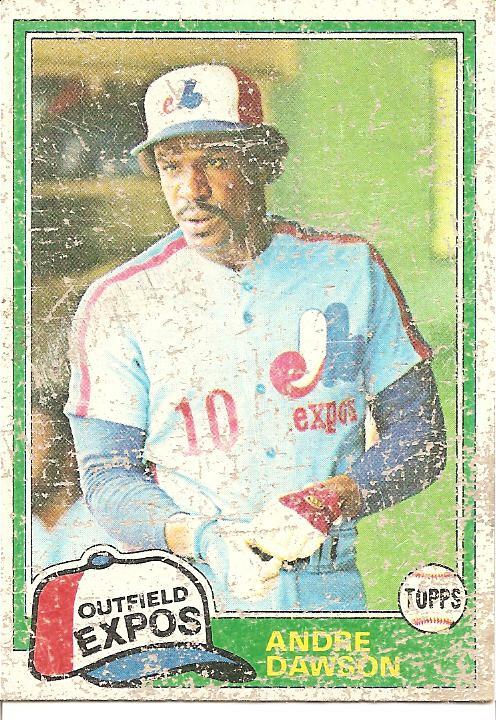 He was the star of my second-favorite team at that time, the exciting and seemingly up-and-coming Expos. They had contended for a division title in 1979 and 1980, and in 1981 when I got this card they would finally claim that title before falling to the Dodgers in the National league Championship Series. Which brings us back to the ballot. Aside from helping keep alive the memory of Les Expos, does Dawson deserve mention on the required 75% of ballots? Rather than approach this question by naming my own hypothetical ballot and then asking for yours, I’m going to try coming at the enjoyable yearly quandary from a different perspective: a pre-draft list. If you could have any player to build a team around, whom would you choose? You will get them for their whole career, for their peak and their decline and even for all their various on- and off-field controversies. For example, say you are considering Mark McGwire for your list. His statistical credentials are monstrous. He would also bring you, as a fan of the team, a summer that would seem as it happened to be a once-in-a-lifetime joy. But then you’d also have to live through the diminishing complication of that joy, if not a feeling that the whole thing had been a lie. Knowing all that, would you put him at the top of your list? Below is my own top ten pre-draft list, with some notes. If I had to make out a HoF ballot, I’d probably go with the first five names. 1. Bert Blyleven. A bona fide top-of-the-rotation ace who stayed productive for 22 years? Not a bad start to build a team around, I say. 2. Roberto Alomar. My preferred hypothetical team-building strategy is to start from the middle out, first finding guys who can field the crucial middle infield and centerfield positions well while hitting as productively as corner players. I actually had Alomar ranked first, but the incident in which he spit on an umpire sours the idea of him as my franchise player just enough for Blyleven to sneak by him into first. 3. Tim Raines. Around this time last year, I took a stab at advocating for Tim Raines. More recently, much brighter baseball analysts (namely, Neyer and Posnanski) have weighed in on arguably the second-best leadoff hitter of all-time and the man most deserving of joining Gary Carter as an enshrined Expo. 6. Edgar Martinez. Hit like Joe Dimaggio, fielded like a fire hydrant until, early on, the Mariners took the glove out of his hand altogether. If you were building a hypothetical team around him, you’d have to be an American League team, I guess. But man could he rake. 8. Dale Murphy. Bill James ranks Murphy as the eleventh-best centerfielder in history and ranks Andre Dawson as the nineteenth best right-fielder. I’m still going with Dawson over Murphy, though, mostly because of his longevity. Murphy had a higher peak, but Dawson’s peak wasn’t too shabby, and he remained productive for considerably longer. 9. Jack Morris. He’s a distant second to Blyleven among the pitchers, but second nonetheless. I think a solid starter who showed an ability to rise to the big occasion is worth inclusion on my list. 10. Dave Parker. Like Alan Trammell, Parker seems to be on the brink of fading out of sight altogether in the yearly balloting. He deserves better. When I was a kid, in the late 1970s, Parker looked like a sure Hall of Famer in the making, and while he stumbled a little after his late 1970s peak, he came back and had a few more very good years. You are currently browsing the archives for the Andre Dawson category.